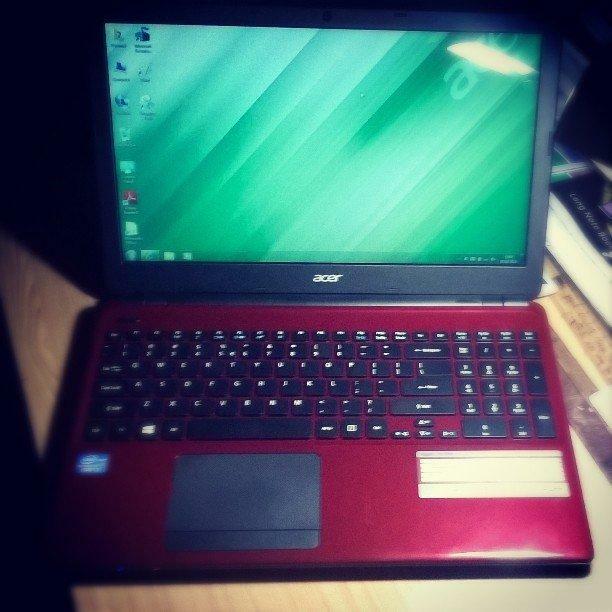 I just thought of writing a review today for Acer Aspire E1-570, as I bought it for my sister who need an everyday use laptop and some multimedia use (movies and music). It costs around 32K and after looking at all the specs and the performance, I find it quite a nice one with good value of money. So, let’s start-up with the features and the things which I liked and disliked and discuss about the power, performance of this laptop. The first thing is that it looks extremely good and quite trendy with its slim design, though I feel that for an everyday laptop like this the glossy finish may be a problem if you work a lot on it and its a totally fingerprint magnet.Even though, I liked the built quality of this laptop and impressed a lot. The laptop comes with Core i3 3rd Gen processor, which comes with the new Ivy Bridge and cut off power consumption upto 40% and that’s why Acer removed 6 cell battery and put a 4 cell battery instead. It comes with 4GB DDR3 RAM (expandable upto 8 GB), which I found totally sufficient for everyday use and a little amount of average multimedia experience. I was browsing the web, listening to music and was even writing this on the MS Word to post it later, and at the same time a couple of downloads was going on Torrent. That’s enough for everyday use, if you aren’t a graphic designer or work with some pretty heavy softwares all day like AutoCAD, Matlab and do a lot of programming stuffs with a lot of windows open. The display is brilliant, gone the days when LCD was just common in every laptop and like every other laptop manufacturer, Acer provided it with a 15.6 inch LED display with 1366 x 768 resolution, which is quite clear and I found it comfortable during normal use. The laptop has a 500 GB HDD, which I had portioned into 4 parts and its sufficient to store your documents and work and also you can store a lot of movies, pictures and other things you wanna store. 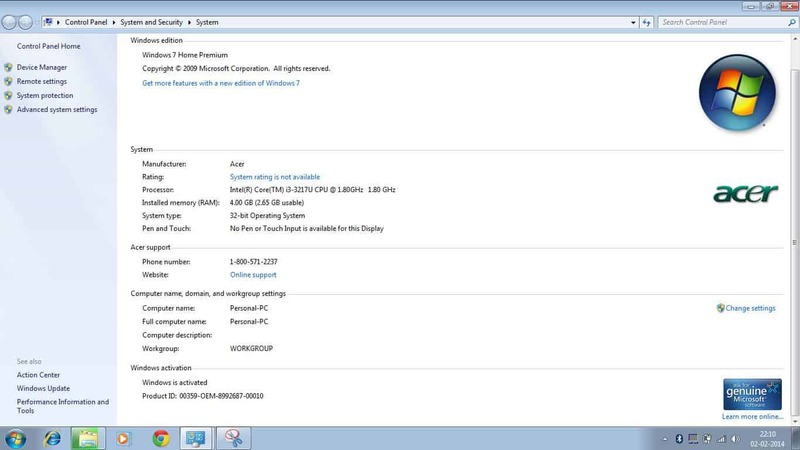 Though I am getting 2.8 GB of 4GB as I installed Windows 7 32-bit (x86), but still its doing well. But I did not feel comfortable very much with the touch pad and the position of nav keys(arrow keys), but the keyboard is comfortable enough for typing and and it has a good space for palm rest. Now coming to some other points. It’s not a gaming laptop at all. It has got Intel™ HD 3000 graphics and not at all meant for gaming, though some casual games like EA Sports Cricket 2007, IGI and a few more can be played, along with the games you download from Windows MarketPlace if you are using Windows 8. Though, now most of the people go for Windows 8, I find it quite complicated and has a few problems and that’s why I installed Windows 7 Home Premium on it. It has got USB 2.0 and 3.0 ports (2 USB 2.0 and one 3.0), HDMI port which is highly essential if you want to stream media on your TV, Bluetooth,card reader, DVD Writer which is sometimes quite useful. About the battery, its a good one and Acer has been always concerned well about mobility and battery life and at full brightness and normal us, it was showing about 1 hour remaining at 27% level and it went off for more than 4 hours during general usage. So, I think it will be a good choice for many professionals and also for students who want to buy a sleek stylish laptop with a good configuration and the power of mobility. Its looks and sleek design. Has a good battery life. Good processing power and speed. The back of the laptop is a fingerprint magnet and attracts a lot of spots. Hope you will enjoy reading this review. Stay connected for more reviews on laptops, tablets and smartphones here on iGadgetsworld. Till then, bye.